We invite you to explore India - the Land with infinite beauty ! Whether you soar high into Himalayas or peer under the ruins of the Ancient monuments dotting the landscape of India, you will cherish the experience long after your visit ! This India Travel Guide on St. Andrews Basilica Allepey is free from any commercial interest! This site is dedicated to promote India - the vast subcontinent, its glorious past, magnificent landscape and its infinite variety. 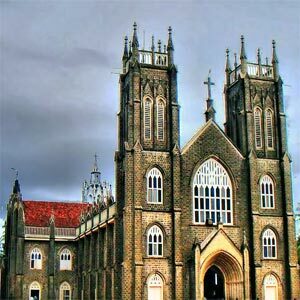 The St. Andrew's Basilica is located in Arthunkal, a small seaside village located about 8 km west of Cherthala and 22 km north of the Alleppey district, Kerala. Built by the Portuguese Missionaries during the 16th century, the Basilica bears a fascinating history. In 1581, the church was constructed using wood and coconut leaves. In 1884, the Portugese priest Fr. Jacoma Fenicio S.J, rebuilt the church. This pious Jesuit priest was referred as Arthunkal Veluthachan, translated from Malayalam as a Arunthkal fair skinned father who had powers to cure illness of body and mind. According to the local legend, Fr. Fenicio was a friend of the Hindu God Ayyapa in Sabarimala and was considered as an authority on Hindu Culture and traditional Hindu rituals. He had performed many miracles and he was addressed as the Second Apostle of the East. Fr. Jacoma died in 1632 and eight years after his death, the church was rebuilt again facing the west towards the long beach on the shores of the Arabian Sea. In 1647, the idol of St. Sebastian was brought from Milan and placed here. This statue depicts the martyred St Sebastian struck with piercing arrows by the Romans for embracing Christianity. The cathedral ( also known as St.Andrew Forane Church) is visited by many devotees who recover from serious illness or closely escaped accidents. They drop in to the cathedral to offer thanks to St. Sebastian, since it is believed that the saint had powers to heal the maimed, crippled and those with mental disorders. Thus many disabled people also visit the shrine. Devotees often express gratitude by crawling on their knees, known as Urulunercha, on the road from the beach to the church, and make offerings - small metal replicas of bows and arrows. January 27 is celebrated as the 'the 8th day or the feast' or ettamperunnal to signify the end of celebrations that begin on January 10. The highlight of this festival is the procession taking the statue of St. Sebastian to the beach and back. Devotees thronging St. Andrews Basilica in Arthunkal offer ‘ambum villum' or models of bow and arrow. An eagle hovering around the skies during this period is associated with fables of the patron saint. During January, Hindu pilgrims returning from Sabarimala after MakaraJyothi, visit this cathedral and pay homage to the saint. The Hindu pilgrims also take bath in the sea or the facility attached near to the church. This custom of Hindus visiting St Andrews Cathedral dates back 1560, when the local Hindus helped the Jesuits construct the church. This custom was drawn from the local legend linking Arthunkal Veluthachan with the Sabarimala Ayyappan. It is a shining example of religious harmony in this untarnished coastal hamlet. The nearest railway station is Cherthala while the nearest airport is Nedumbassery in Kochi.